Mutations. 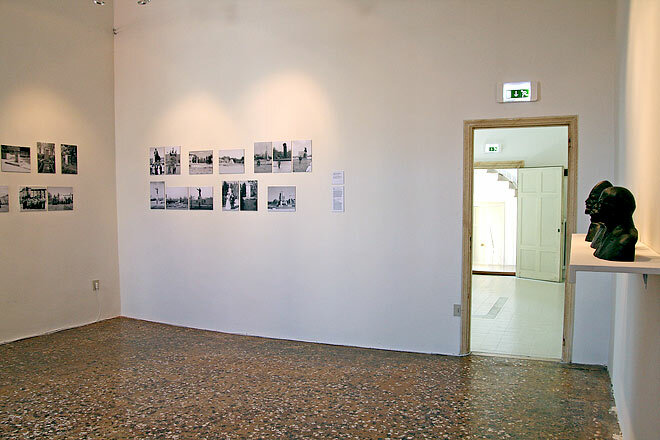 His photographs and sculptures at the Central Asian Pavilion, Venice Biennale 2011. The research of various metamorphoses, stratification, and paradoxical intersections occurring in the background of a turbulent political situation in Central Asia in the last twenty years, is one of the main motives of Yerbossyn Meldibekov's artistic work. Mutation (2010), presented at the Central Asian Pavilion of the Venice Biennale 2011, is one of the many possible configurations of this long-term research project, in which Meldibekov is interested in the changes - or better say mutations - of visual language in which political power communicates with the public. The project represents a comprehensive study of the transformation of urban environment - primarily sculptures and monuments - associated with the change of political priorities, trends, moods, or the change of political regimes themselves in Central Asia. According to Meldibekov, the starting point for this research was a rather well-known situation; the change of a few monuments in the central park of Tashkent. The first monument, a sculpture of Turkestan Governor General Kaufman was erected there in the early 20th century, and the last one was of Tamerlane, in the years of Uzbek independence. Meldibekov's research includes three approaches. The first approach may be called psychoanalytic. As we know, the unconscious reveals itself in slips of the pen, in slips of the tongue and in involuntary gestures. The artist listens to and observes the unconscious in the discourse of power - paradoxical quotations, oxymora and 'punctums' of the official visual language. The artist identifies the flickering Christian image of the Virgin Mary, embodied in the Soviet "Motherland", and then in the "Mother of Uzbekistan". However, the most interesting are the pedestals - left without the statues of leaders and other ideologically significant characters of the Soviet history, and having lost their functionality they turn into avant-garde sculpture par-excellence - abstract self-referential objects. The second approach of Yerbossyn Meldibekov is anthropological. German Egyptologist and researcher of cultural memory, Jan Assman was one of the first ones who suggested the idea of the monument as a medium for transmitting culturally significant content. The ancient Egyptian 'monumental discourse', which he investigated, was "an environment in which the state clearly embodied both itself and the eternal order". Perhaps the desire to get in contact, if not with eternity, but at least with something epochal and stable, which is expressed in the monumentality of sculptures, explains the habit of modern humans taking photos of themselves in front of monuments. Such photographs are always the intersections of two lines, two histories - the small and the great. Family or personal micro-narratives in these photos are always supplemental and somehow accidental in the background of a 'greater History'. People grow old and die, while monuments remain unchanged. On numerous photographs that were collected by Yerbossyn Meldibekov, in his project Family Album, part of which is presented in Mutation, the opposite is true. An image that was taken recently corresponds to an old, Soviet era photograph. On the former, there are the same people photographed in the same place a few decades later, but in front of an entirely different monument. In a lifetime, people experience the change of several epochs, each of which tends to express itself monumentally, clearing the sacred site of profane 'idol' of predecessors in advance. Connotations that are traditionally associated with representations of micro-stories are carried over to images of macro-narratives and vice versa. In a world devoid of eternity, permanence and stability are only acquired in oneself or in the closest relatives and friends, while the monumental granite and marble giants are no more than decorations, a temporary and easily removable milieu. While a researcher-scientist presents his results in the form of texts, a book or a scholarly article, the researcher-artist creates an image. The creation of the image gives the artistic research the status of a unique cognitive act. The third research approach of Yerbossyn Meldibekov is actually the creation of an image. Yerbossyn studied sculpting. The choice to do so was a conscious decision, as he wanted to sculpt 'the leader of the world revolution'. Of course, he was not led by ideology but by purely mercantile considerations. The unique images of Meldibekov - sculpture mutants - are satirical imitations of frank tili , the language which official sculptors speak, and also a visual summary of his whole research. This is how the author describes it: "Some ideological sculptures I 'bring' to post-modernism with my own hands, or expose them to a process of de-ideologization... Let's take the example of a small bust of Lenin - if it is stretched horizontally, it becomes like Genghis Khan. If it is crushed vertically, it will look like Giacometti. If you increase the size of its lips, it turns out to be Lumumba - this reminds us of the similarities between African and Kyrgyz riots. The main meaning and method, which is used in creating the sculptures in this project, is the instability and fluidity of the situation in Central Asia." Jan Assmann: Cultural Memory: Script, Recollection, and Political Identity in Early Civilizations. * 1984, curator of the Platform SHTAB (School of Theory and Activism – Bishkek). Lives in Bishkek, Kyrgyzstan. The text is part of the essay "Франк тили - Франк тiлi - frank tili ", published in the catalogue of the exhibition "Lingua Franca", Central Asian Pavilion, 54th Venice Biennale 2011.